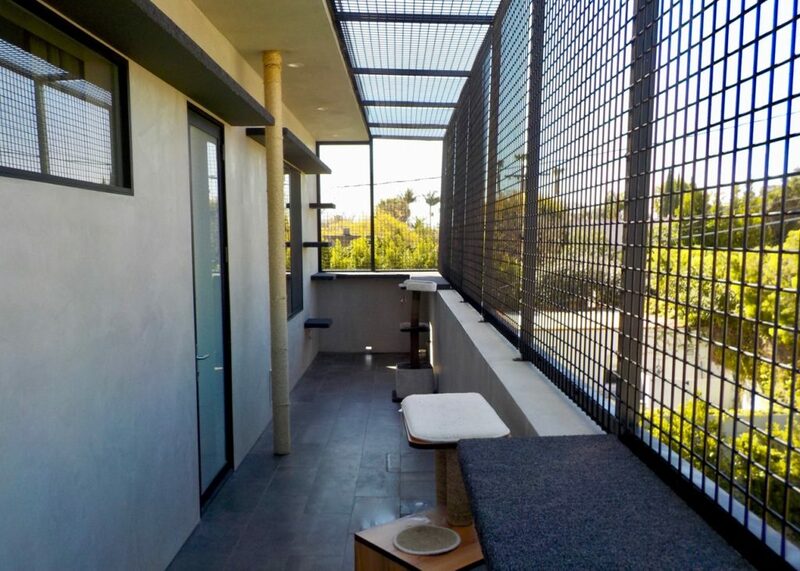 Famed hair colorist to the stars, Tracey Cunningham, who is also a Redken spokesperson and celebrity in her own right, hired Custom Catios to build an exquisite second story balcony catio for her modern home in the Melrose area of Los Angeles. Tracey, who according to Vogue, “regularly jets between Dubai, Europe, and the Kardashian compounds in Calabasas,” also counts Emma Stone, Drew Barrymore, Mariah Carey, and Jennifer Lopez, among her clients. When she’s not Keeping up with the Kardashian’s, Tracey can be found caring for her six cats, which includes providing them with plenty of protected outdoor space. 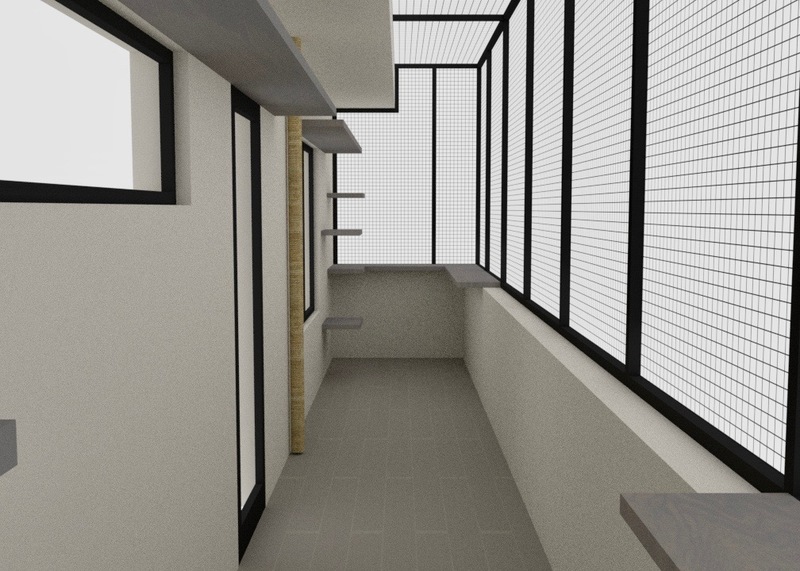 The catio measures a whopping 38′ long, 10′ high, and 6′ deep. In other words, it’s ginormous! We added matching shelf “staircases” on either side of the enclosure leading up to two long platforms at the top of the structure. Together, the shelves and platforms create a cat superhighway, giving the pets ample room to run, climb, play, and hangout. 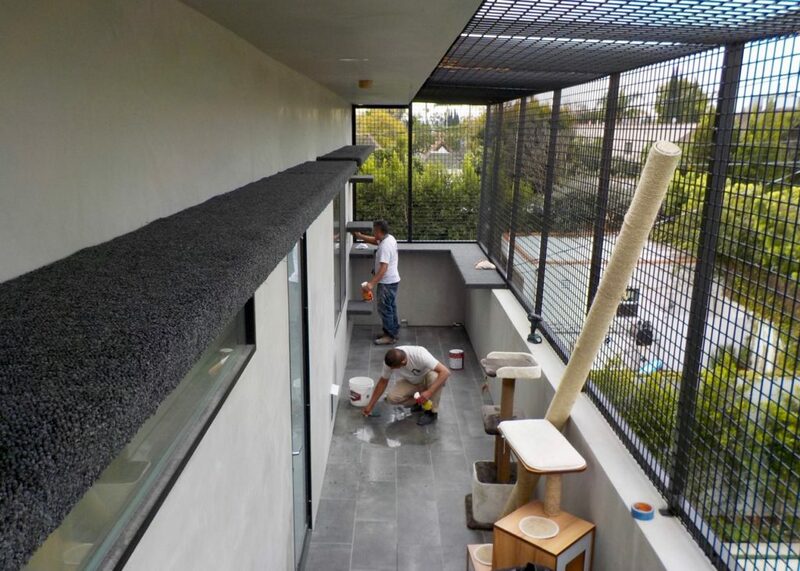 The 10 foot sisal rope pole, which surpasses the length of the one we created for Jackson Galaxy’s Animal Planet show “Cat vs Dog,” is crazy cool. The cats can scratch on the pole to their heart’s delight or take a shortcut straight up to the upper platforms. They will certainly get their exercise. 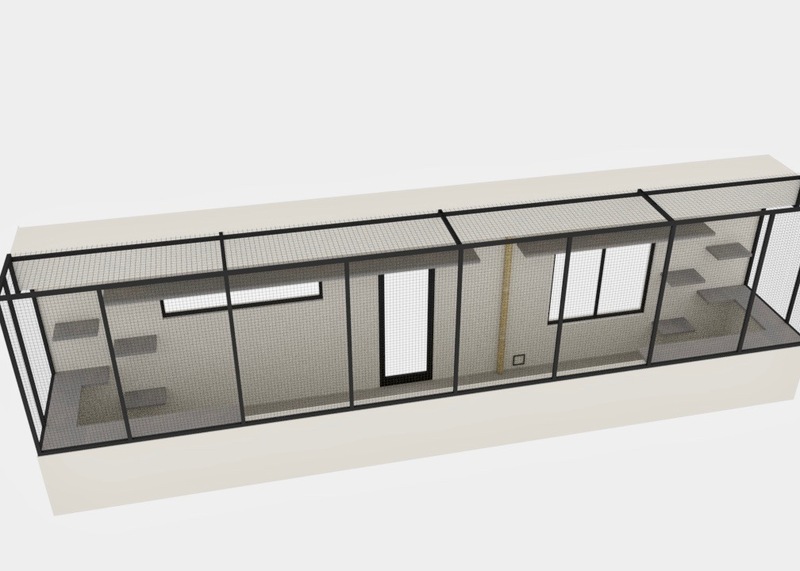 Custom Catios enclosures differ from prefabbed modular designs in that we always build ours with humans in mind. And Tracey’s catio was no exception. As such, we left plenty of room for Tracey and her family to hang out with the cats. Additionally, we built in “floating” shelving. With no visible brackets holding the shelves in place, they appear to be floating in thin air, which adds a dramatic effect to the beautiful aesthetic of the house. Finally, with the recent spate of fires throughout Los Angeles, we added a fire escape. 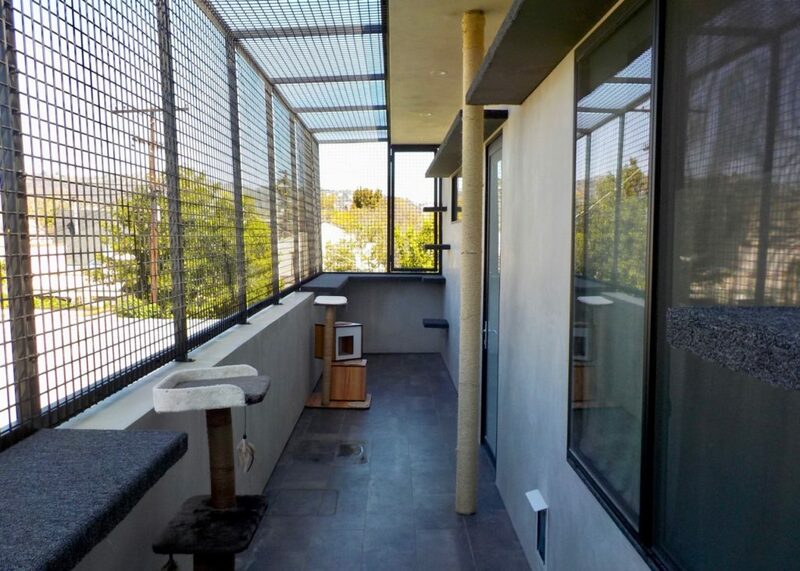 This is unquestionably one of the greatest catios ever built on a balcony. The cats love the massive space, cat superhighway, and extra long sisal rope pole. Meanwhile, the humans can point to the high-end styling which matches their upscale home.